Stronger than polypropylene strap making it more suitable for heavier loads. Minimal stretch,light weight,and easy to handle and dispose of. Accepted method of securing articles or packages in a wide range of industries including wool bricks and general engineering. Ideal for heavy loads. 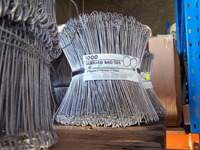 Poly Woven Strap is a safe alternative to steel strapping. 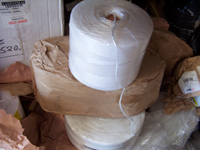 This soft polyester-based, woven strapping yields high breaking strains without the associated safety risks of steel. Safe, Lightweight, Retensionable, Weather Proof. 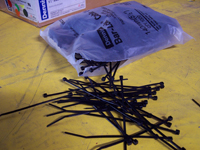 Metal Crimp Seals for polypropylene, polyester and steel strap. Wire and Poly Buckles to fasten woven and poly hand strapping. Protect valuable edges and stabilize loads with angleboard corners and lengths for all types of packs in cardboard, plastic and metal. 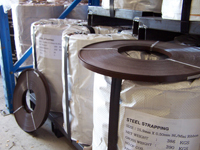 Comprehensive range of strapping tools and equipment includes manual and automatic machines. 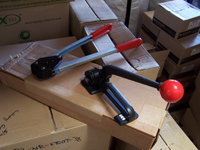 Hand tools and strapping dispensers also available. Least expensive type of strapping. 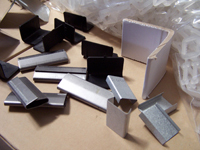 Applied by hand or machine and fastened by metal seal, poly buckle or welded joint. Ropes, Polypropylene Lashing, Shop Twine, Sisal Twine, Sewing Thread. 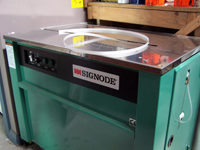 A range of semi auto and fully automatic strappers with fully back up service and parts. Designed to secure cables without damaging the insulation- no projecting locking devices or teeth. 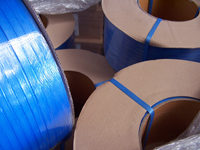 Many other uses such as securing poly bags, hessian sacks and attaching tags. Many sizes and grades available.